This easy soup recipe uses frozen broccoli, so its really convenient and there's no chopping required either. Melt the butter in a large pan over a medium heat. Add the onion and cook gently for 4-5 minutes until softened. Add the frozen broccoli and cover with the hot stock. 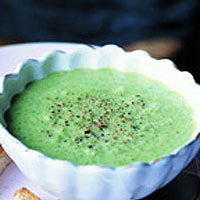 Bring to the boil, then simmer for 12-15 minutes or until the broccoli is very tender. Remove from the heat. Crumble the Stilton into the soup and stir until melted. Season generously and blend in batches until smooth. Serve immediately, with toast.